One of my favorite things about blogging is coming up with creative/sarcastic/witty titles. You know the ones that may give you a little hint about what you are going to be talking about or ones that have practically nothing to do with what you are going to be talking about but the title gets your attention and reels you in. Most food blogs have post titles that say the name of the recipe or that specifically state what they are going to be talking about. “Buttermilk Biscuits” or “Interview with so and so” or “Giveaway,” now there is nothing wrong with these, I in fact have done the same thing, but what is the fun in that!?! 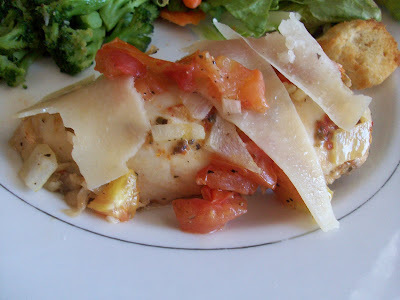 Recently on the blog The Girl Who Ate Everything she had a posting for Grilled Bruschetta Chicken. The recipe she had was very similar to one that I have made in the past. I had been planning on making this chicken and had gotten the cherry tomatoes and basil at the store on Saturday or Sunday (I can’t remember exactly). I then picked up the chicken on Monday and was planning on making the chicken on Tuesday for dinner. I marinated the chicken and eventually started making the other sides. I threw the chicken in the oven and it was almost ready (well technically it was almost ready after 30-35 minutes). I went to get the cherry tomatoes and basil out of the fridge and they were no where to be found. No where. I looked high and low, I pulled every thing out- no where. I was seriously doubting that I even got them. But I knew for sure I did. I had too have bought them and gotten home with them and put them away. I remember (and my memory is perfect). So I went and asked Eric (my boyfriend) if had seen them and he said that he had and that he threw them away. I asked why (in a shrieking, high pitched voice). He said that on Monday he went to get a drink and saw the tomatoes and basil and thought they looked bad. He said he thought he was helping me and doing a favor by throwing them out! So I had to think quickly (since my chicken was done by now). I still wanted to make this chicken. So I pulled out regular Roma tomatoes cut them up and used them and had to sadly do without the basil. This version turned out fine but was much better when I made it before using the cherry tomatoes. The cherry tomatoes just have a great, sweet flavor when they are roasted. Marinate chicken in salad dressing for several hours or over night. Preheat oven to 350 degrees F. Arrange chicken in a glass baking pan. Bake at 350 for 35-40 minutes. Arrange tomatoes, garlic and onions on a baking sheet. Drizzle with seasoned olive oil. Place tomatoes in oven for the last 15 minutes of the chicken’s baking time. Remove tomatoes and chicken. Plate chicken and top with roasted tomato mixture, some basil and Parmesan cheese. ***Tip for my Kitchen Challenged sister (you know who you are). (Hey that would be a good idea for a blog, Rach, “The Adventures Of The Kitchen Challenged”) To chiffinade something means to cut something (usually herbs or spinach) into long, thin strips. This is accomplished by stacking leaves, rolling them tightly, then cutting across the rolled leaves with a sharp knife, producing fine ribbons. The reason one of the possible titles for this blog entry was “It’s A Miracle: I Ate Tomatoes, And I Liked It,” is because I have been a self proclaimed tomato hater for my entire life. I can even remember my very first times trying to eat tomatoes as a kid and gaging uncontrollably(horrible and life haunting experience). However, as I have grown and matured my palate and I have discovered that if cooked the right way or added to the right foods, that I (and I can’t believe I am writing this) actually like tomatoes. I really like tomatoes (specifically cherry/grape tomatoes) roasted. They become so sweet and tasty when they are cooked that way. You should try eating them that way, if you too are a self proclaimed tomato hater. « Opps… I Did It Again…. My daughter hates tomato but loves tomato sauce. Go figure. Once the real tomatoes are in, I make bruchetta every other day! Have never throw in it on chicken but it’s a grand idea. It still looks delicious even without the basil! Enjoying your blog, immensely! I’m always on the lookout for new chicken recipes. This is one I’m going to have to try!